Love soup? Be sure to check out my other soup recipes (my favorite thing to cook and eat that isn’t chocolate!). I signed up to bring a soup to a luncheon earlier today. 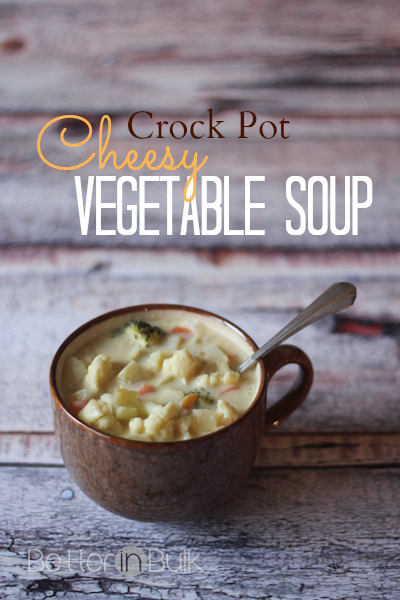 It was the perfect opportunity to make a cheesy vegetable soup that I had been craving. A friend of mine made this soup many years ago at another, smaller luncheon, and we all asked for the recipe before we had finished eating. The same thing happened today. Place chopped vegetables and chicken broth into crockpot and cook on low for 4-6 hours, or until vegetables are soft. 30 minutes before serving, prepare sauce: On the stove melt butter; then add flour, mustard, salt and pepper. Stir until combined. Slowly add milk and cook on medium heat until thickened. Add sauce to crock pot along with cheese. Stir until cheese is melted and fully combined. To make chopping so many vegetables a whole lot easier, I use my Vidalia Chop Wizard, a handy tool my mom recommended that I buy…and that has become one of my favorite tools in the kitchen. Instead of taking hours to chop vegetables by hand, it only takes me 30 minutes to prepare everything for the soup. Variations: Obviously, for a vegetarian meal, it’s easy to substitute vegetable broth for the chicken broth. The soup would also be yummy with some added chicken. Veggies can be blended after cooking if you prefer a less chunky soup. Note: Amazon affiliate code used in post. I make a recipe almost identical to this one, except I use medium cheddar cheese and not processed cheese. If you add it to the sauce mixture and let it melt together before you add it to the soup, it works great! Thanks! I need to get this soup back on the meal calendar, because it’s the perfect weather for it (finally!). I made this yesterday with shredded Colby-jack cheese, and used Dijon mustard. It was WONDERFUL, but I may use processed cheese next time because of separation. Will definitely make it again. Thanks! Beki, Glad you liked it! I’ve tried it with regular cheese, too. Normally I don’t like processed cheese, but in this case, it works best. I don’t like American cheese or velveeta cheese. Anyway that I can substitute cheddar cheese or non-processed? Sounds like a very good recipe otherwise. 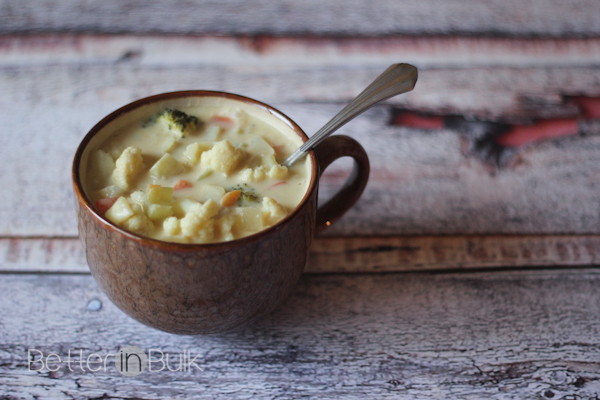 I won’t eat processed cheese in anything other than this soup, so I hear you! I’ve tried cheddar in other soups and they simply don’t melt the same way. You can definitely try it, but my guess is that it won’t be as creamy and integrated into the soup as the processed cheese. I’m so excited to use this recipe! It’s just perfect for the winter and doesn’t involve too many ingredients. Thank you! This soup is amazing! Thank you for sharing! Everyone loved it! I made this today for dinner and it was incredible. I ended up only doing 4 cups of stock and one cup of water to reduce the sodium and added in an extra tablespoon of mustard (I used spicy brown mustard). So excited that it made enough to freeze for later enjoyment! Thanks for the recipe!! What is the sauce that is mentioned. I do not see what sauce it is or the recipie for it. This looks awesome, can’t wait to try it! Oh my goodness, this looks so yummy and easy to make. I promised my dad I would find him some recipes to cook with the crockpot I bought him for Christmas, and this just looks perfect. Thank you so much! !